In addition to refinishing kitchen cabinets, Frank's All Surface Refinishing can Refinish your Bathroom Vanities at a fraction of the cost of replacing. Removing the vanities often necessitates removing the countertop and disassembling the plumbing. This can double your already high construction expenses. 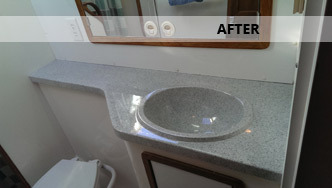 Refinishing your Bathroom Vanity is the cost effective solution to your problem. 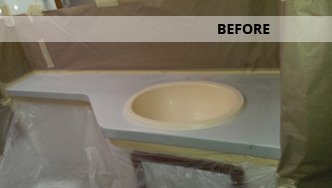 Usually within 3-4 hours we can apply a hard, durable coating, in any color, to your existing Bathroom Vanities. We use a 2 part resin coating that will stand up to the excessive moisture of normal Bathroom use. We are so confident of your satisfaction and with our satin finish that we provide a Lifetime Warranty against any lifting of the material. This permanent Refinishing process that we have perfected over the last 20 years will last the life of the cabinet. Frank will give you a Free Estimate and we can also suggest color selection. Many times it is also more economical to refinish your bathroom countertops at the same time as your Vanities. This will allow you to coordinate your color selection, which will enhance your entire Bathroom remodeling project. The results are dramatic. The costs are minimal and we can provide the expertise to bring your project to a speedy completion.